So I finally read The Shack. In the beginning, I wasn't sure that I would. Many of my Christian friends had been talking about how wonderful it is, but some of the things they said really gave me pause... especially when one of them said that "Papa" in the story is a woman. "Sounds a bit heretical," I thought. Still, I found myself somewhat drawn to the title, and when I strolled past it in Wal-mart of all places one day, I couldn't resist picking it up. I'm one of these people who can glean good things from a book and chuck what I don't agree with in the trash, so I really wasn't too worried about being converted into heresy by reading one book. Also, the pastor dude and I would be going on a spiritual retreat soon, and it just so happened to be at a B&B called, "The Shack." I thought that was an interesting irony, and tucked the book away with our luggage. In the weeks that passed, I stumbled upon a few reviews of the book online. The general consensus was that it was kind of good, but not really worth my time. Still... I found myself drawn to it, I'm sure partially because I have this "find out for myself" mentality about things. While I do appreciate the reviews and insights of others, they just have no way of knowing what I'll like/dislike and what I will/won't find touching. I did appreciate the warning that the first few chapters are a bit wordy and descriptive, which probably kept me from putting it down in frustration. 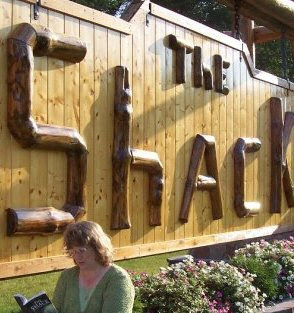 So, when we arrived at "The Shack", I had my husband take a photo of me pretending to read The Shack. I thought a friend of mine would get a kick out of that. The agenda for the evening was to eat, rest, and sleep in the next morning so that we could start our week of spiritual renewal on the right foot. When I did get out of bed, I read my Bible, prayed, and then curiosity just got the better of me. My friends spoke of how this book had really impacted them, and I was just in a place in my life where I was struggling and needing to draw close to God. "If it is indeed heretical," I thought, "I'll put it away, knowing that I've at least looked inside to see if there's anything worthwhile." I enjoyed the prologue, but yes, some parts of the first few chapters were difficult to get into -- I had a hard time with the odd names of places, imagining the setting (though I've had the same trouble with many fiction books I've read in the past), and he introduced too many characters at one point for my brain to keep straight (two couples, one with children, whom I kept getting confused with each other). However... once I got into it, I couldn't hardly put it down. Finally, it was time for the lead character to meet "Papa". I hesitated because I knew this part of the book had the potential to really mess with my good senses. I worship God, not a goddess. But, to my relief, Papa wasn't a woman. Rather, Papa had just chosen to initially appear to Mack in the form of a woman, and with some very good reasons. To me... that is an important distinction -- not that there's anything awful about women (I'm one, ya know! ), but if the Bible presents God as Father, Son, etc. then I want to keep with the Bible. I chatted a moment with my husband who was reading nearby, and he made a really insightful comment -- "We are created in the image of God, but God is not conformed into ours." He thought he might have put what the author said a little bit differently about God and gender, but it didn't offend his sensibilities. There were a few other theological statements that I ran past my husband. The biggest one was the idea that there's no hierarchy in the trinity of God, but rather a mutually submissive relationship. For some reason, maybe I'd read it somewhere, I always saw the Father in charge and the Son and Holy Spirit as submissive to the Father. To my surprise, my husband actually said, "No. They're equal." Wow... I learned something new about my husband's beliefs that day, and I did love that picture of God I was given. Through the conversations with God, the book's author made several profound and insightful observations. I jotted down several quotes as I read. The conversation about the difference between expectancy and expectation is one that really got me thinking. Another intriguing topic of discussion was the self-centered way we judge for ourselves what is good and what is evil, while God has an absolute standard. And the most convicting one for me: "We want a God who will just fix everything so no one gets hurt." I know the book draws criticism for supposedly promoting an idea of universal salvation. However, I didn't get that impression. At one point, Mack asks God if all roads lead to Him, and God says, "no," but that He'd travel any road to find someone. To me, that is in line with how God reveals Himself in scripture -- the one who is not wanting for "any to perish" and will move heaven and earth to orchestrate a meeting between a man traveling from Jerusalem to Gaza with one traveling back to Ethiopia. Wordiness aside and bottom line: I loved The Shack!!! I went in thinking I may be able to glean a few things amidst some incorrect theology, and couldn't have been further from the truth. While I don't completely buy into every concept presented, and I elaborate on that a bit more in my comments to this entry, it is a beautiful book with a plot that is well developed, and... I loooove calling God "Papa" -- so intimate, personal and spot on -- see Mark 14:36, Romans 8:15,and/or Galatians 4:6. I'd read those verses many times before, and "Abba" never quite cut it for me. "Daddy" even sounded strange, maybe because that's what I called my father when I was younger. But "Papa" is just perfect. As I finished reading, I found myself wondering what God thinks about this book. I do feel like He led me to read it -- I needed to hear what The Shack had to say. My husband wants to read it now, too, and I look forward to the theological insight he can give me from his seminary years. I'm sure there are nuances here and there he will notice that I did not. But you know... even if there are... I believe God loves us in spite of our imperfect theology, and I believe all denominations and non-denominations, strengths and all, have missed the boat somewhere. I don't believe it is dangerous to read a book by someone whose theology is different than ours. Even when we differ, we have so much to learn from the insights of others. People and their ideas are far too complex to be labeled, stereotyped, and summarily dismissed. I am so glad I gave The Shack a chance, and I know Papa was smiling as I did. He already knew -- our relationship will never be the same!